In cold climates, winter comes along each year and does its best to destroy our water pipes. The best way to minimize the damage from cold weather on household plumbing is to do a little preventive winterizing, which essentially means protecting them against the freezing that can expand the water and rupture pipes. Burst water pipes can cause thousands of dollars of damage when water soaks walls, ceilings, and floors, so it just makes common sense to take some time to prevent the possibility. A good starting point is to winterize outside faucets (hose spigots). This is relatively easy to do with simple insulated covers that fit over the spigots, which cost between $10 and $20 at home improvement centers. Installing these covers, along with performing a few simple winterizing procedures, can prevent outdoor faucets from rupturing due to freezing. While there are specialty outdoor spigots marketed as "freeze-proof," there is no guarantee that these faucets will not freeze in the coldest weather. Even these faucets can benefit from outdoor faucet covers properly installed. Long term, though, installing freeze-proof spigots is a good next step to avoiding problems. This is best done while the weather is still above freezing. Most faucet covers use one of two styles. Either they are made of rigid thermal foam with a flexible gasket along the edges, or they are flexible insulated bags that secure around the spigots. If they are properly installed so that they seal tightly around the base of the faucet, either style provides good insurance against spigots rupturing due to freezing. Faucet covers work by trapping heat that naturally radiates through the interior pipes to the outdoor spigot. The insulated cover prevents this radiated heat from escaping and therefore prevents water in the faucet from freezing, expanding, and rupturing the spigot. Outdoor faucet covers come in several different styles. Manufacturers may market them under several names, including "garden faucet insulation cover" or "insulated faucet socks." All of them will do the job, but for best results, they need to seal tightly so they can provide thermal protection. Installing outdoor faucet covers should be done in conjunction with some basic winterizing procedures aimed at removing as much water as you can so there is little or no trapped water that can freeze inside the spigot. No matter what kind of outdoor spigots you have, freeze-proof or not, it is very important to remove any hoses, splitters, or other fittings screwed onto the spigot before winter sets in. 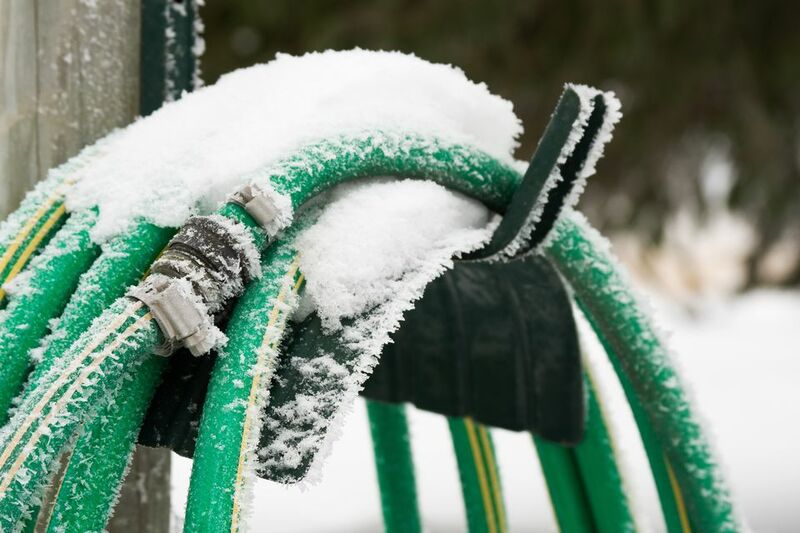 Not removing hoses can trap water and make it much more likely a faucet will freeze. This is always a difficult step because most people will want to use the outside water until the very point when the freezing weather begins. It’s best to preempt the cold weather by disconnecting hoses early, since even one night of freezing weather can cause a break in the pipes. The next step to winterizing outdoor faucets is leak detection and repair. Check all spigots, yard hydrants, and other fixtures for leaks and drips. If you do find any problems, repair or replace the fixture before the temperature drops to freezing. Dripping water indicates a spigot with a leaky washer or cartridge, which can block up and freeze in the spigot or in the pipe feeding it. Getting as much water out of the pipes as possible is the next step. If you have an outdoor faucet that is not freeze-proof, the best way to do this is to shut off that line, if possible, and drain the water from it. This can be done by shutting off an interior shut-off valve to the water line leading to the spigot, then opening the spigot and leave it open for a few hours until water inside the pipe drains out. After the water drains out, close the spigot again. Do this when the temperatures are above freezing. Where there is no indoor shut-off valve, it becomes even more important to carefully insulate the spigot from outdoors. With a frost-free spigot or a yard hydrant, this step isn’t necessary since the fixture design keeps the water well back away from the end of the spigot. However, just as with regular outdoor spigots, hoses and other attachments should be removed from frost-free spigots and yard hydrants before the winter, or they may not drain down properly. The last step to winterizing outdoor faucets is to protect them with insulation. An easy way to do this is to install an outdoor faucet cover on each outdoor fixture, including frost-free spigots. Faucet covers are either square or dome-shaped shells that fit right over outdoor faucets, or they are flexible bags made of thick fabric stuffed with insulation. When covering regular spigots (not freeze-proof), extra loose insulation can be installed inside the faucet cover to keep it warm and dry throughout the winter. In most situations, however, the faucet cover will provide enough insulation. Frost-free spigots should be covered, as well, because, although they are resistant to freezing, they are not completely frost-proof in the coldest weather. There are rubber gaskets and washers inside the frost-free spigots that will benefit from the extra protection from the cold. Your outdoor faucets are now protected for the winter, and its unlikely the either the faucets or the pipes running into the house will freeze or rupture. At the end of winter, remove the faucet covers and store them for use the following winter. They can usually be used for several years before replacing them.